And how was it? 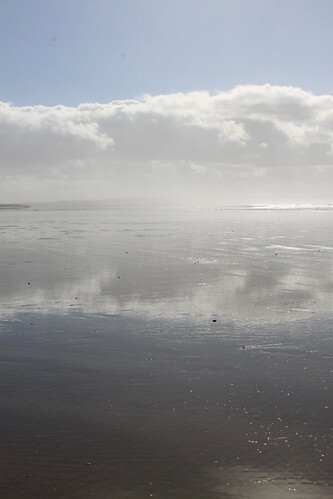 Well, if you haven’t been to Saunton Sands already, then go. Now. It’s amazing. 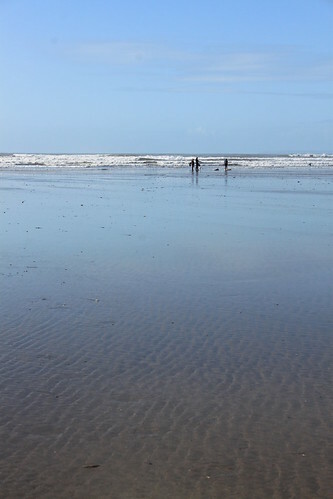 There really are miles and miles of perfect sand, overlooked by a very impressive art deco hotel and inhabited by all manner of surfers, dog walkers and people just out for a day at the seaside. I’m not a surfer (yet), so my knowledge of such things is fairly dire, but the beach looked like a great place for catching some waves when the weather and swell are right. 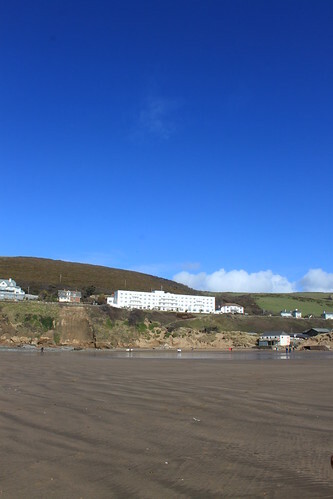 And the extremely popular surfing beach at Croyde is just around the corner. The surf was a bit messy when we were there, but there was a growing crowd of wetsuit-clad surfers gathering on the sand, evidently hoping for better waves as the tide came in. 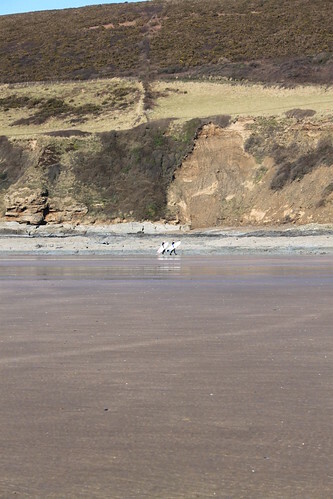 These two struck me as particularly amusing, marching across the sand with their boards. There was a constant stream of surfers trundling in both directions, in fact, like a dual carriageway of tiny ants heading home with leaves they’d collected. With the spray from the sea blurring the boundary between beach and sky, and with the sun reflecting on the sand, it was easy to lose all perspective of time and place. If there’s a dog heaven, I suspect that it looks something like this. As you’d expect, Molly was very much in her element. 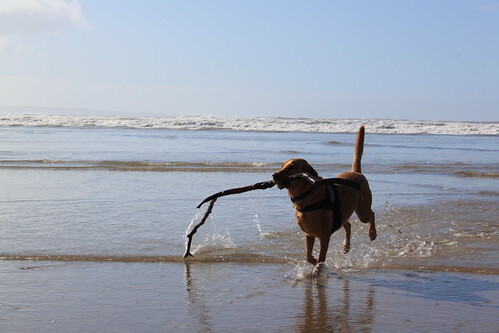 She took it as her personal mission to dive into the surf and to pull out anything floating in the breakers. Here’s a haul of which she was especially proud. We walked out along the beach for a good hour or so before turning around. We kept saying we’d just head ‘out to that corner’, but the fabled corner stayed – mirage like – tantalisingly out of reach. If, indeed, it existed at all. 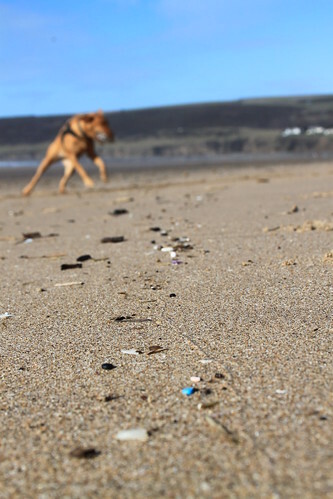 As we ambled back towards the car, I was struck by the delicate specks of stone, wood and plastic that had been washed up by the tide. I had a go at taking some ‘arty’ shots with my camera, but – as you’ll see from the photo below – it’s very difficult to do anything like that when you’re accompanied by a hulking great lump of a Labrador who would really prefer that you spend your time chasing her along the beach. ..
* I apologise for my terrible lack of blogging recently. I have no excuse whatsoever. Sorry. 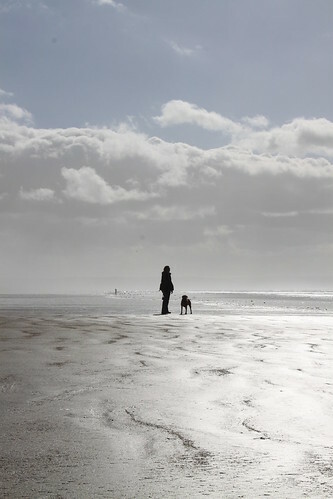 This entry was posted in Dogs, Outdoors, Photography, Travel and tagged Devon, Dogs, Photography, Saunton Sands, Travel, Walking by Simon Perks. Bookmark the permalink. Awesome pictures, really gorgeous. Especially the 2 last ones. Thank you – that’s very kind of you. I’m glad you like them.